Several weeks ago I shared what happened when my foot met the wallâ€™s metal corner strip; the outcome wasnâ€™t pretty for either one. I also shared my trip to the Emergency Room and how my husband was told to leave my side because there was not enough room for two wheelchairs, in spite of explaining I needed him for communication purposes. Thanks to a concerned reader, my post was forwarded to the Emergency & Traumaâ€™s Program Quality Improvement Assistant for the Fraser Health Authority. An investigation was launched and I was informed that I could expect a response within thirty business days. I made a note on my calendar. Last Tuesday â€“ thirty business days plus a few â€“ I emailed the Program Quality Improvement Assistant to ask when I may hear the outcome of the investigation. A short while later I received a call from the Emergency Department Manager. Thankfully Darrell was home to act as interpreter: the telephone isnâ€™t my most effective means of communication. The manager apologized for her tardy response. She continued by explaining the ER is experiencing an extreme lack of space and that she is hoping the $700 million expansion will have more space. Space for patients in wheelchairs would be nice. She further explained that Darrell being told to leave should not have happened and she has discussed this with her staff. When I asked what I should do if the situation should happen again, she offered her direct number, which, although kind, I wasnâ€™t sure that would be practical in an emergency situation. She then said I could ask to speak to the nurse-in-charge â€“ a much more direct and practical solution in my mind. I thanked her for her time. Initially, I felt that launching an investigation into a relatively minor incident (compared to the life and death situations the ER faces) was overkill. But I now have the words â€œask for the nurse-in-chargeâ€ (words that hadnâ€™t previously occurred to me) for next time, and next time might be more serious than an extremely sore foot. Sharing an upsetting experience in a blog post may be therapeutic, cathartic, and may garner a few comments or tweets. But readers might also be moved to take action based on words I have written. As a blogger, I feel I have a responsibility to not post a rant and leave it at that. I believe I need to write a follow-up post, much like this one, sharing what actions I took, what insights I gained, what lessons I learned, or something so that readers can also gain or benefit from it. I consider this responsible blogging. In this specific situation, I can appreciate that the initial incident â€“ Darrell being told to leave â€“ was more a concern for keeping pathways clear should a stretcher need through urgently than a blatant denial of my access to communication; although the end result was still being denied access. I get that space is an issue; one symptom of our broken health care system. I did feel it necessary to allow the hospital staff the full thirty days for their investigation process without a barrage of emails on my part. I appreciate more urgent, more life threatening issues likely came up, delaying their response back to me. I also felt it necessary to remain polite and understanding. At no point was there a reason for being rude or for escalating action, which may have resulted in me being blacklisted at the hospital, interfering with receiving appropriate care in the future. In the end, patience and understanding are key when advocating. 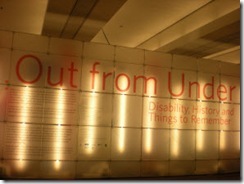 Presented as part of the Cultural Olympiad, Kickstart Disability arts & culture is hosting the groundbreaking exhibition â€œOut From Under: Disability, History & Thingsâ€ that pays tribute to â€œthe resilience, creativity and cultural contributions of Canadians with disabilitiesâ€. The exhibition is on now until Sunday, March 21st at the University of British Columbiaâ€™s Robson Square campus. Darrell and I took in this display while at Robson Square for the Paralympic Torch Relay. I found the display to be a sobering reminder of people with disabilities were treated or, more accurately, mistreated in the not so distant past. Every object has a history. And every history has some relationship to disability. One simply needs to dig for it a little. Shovels have been used in conditions of forced institutional labour and to bury disabled people in unmarked graves. Fancy shovels with commemorative plaques have been used at sod-turning ceremonies for rehabilitation facilities, as a way of recognizing charitable benefactors. communities to do whatever garden or yard work they choose. As disabled people find and claim their power, they take hold of the tools once used to push them under. The ordinary shovel was accompanied by a photo of the mass grave site at the Woodlands School in New Westminster. That could have been my fate had my parents listened to the medical professionals and had institutionalized me because I â€œwouldnâ€™t amount to anythingâ€. Chilling! Ironically, after viewing this historical display of how people with disabilities have struggled to overcome oppression, I had to wait for an UBC employee to unlock the wheelchair washroom. The menâ€™s and womenâ€™s washrooms were unlocked, but the wheelchair accessible washroom required a key. WTF? I couldnâ€™t believe it! What happened to freedom and independence when I need to wait for someone to come to unlock the door so that I can pee? However, this was nothing compared to what it took for one of the exhibitionâ€™s curator and disability rights activist Catherine Frazee to travel from Toronto to Vancouver to be at the show during the Paralympics. Unable to fly due to her disability, Catherine decided to spend four days and nights to travel by train; historically the railway united the country and she was looking forward to experiencing that part of Canadian history. But Via Rail insisted Catherine and her customized wheelchair had to travel separately; not a possibility for her. Catherine and her assistant/life partner were forced to drive down to Chicago to board the Amtrak with an accessible sleeping car to travel to Seattle and rent a van to get to Vancouver. Can you imagine denying Canadaâ€™s top disability rights activist the use of her wheelchair when traveling by train? Perhaps a wheelchair accessible washroom key and a Via Rail ticket will be added to the â€œOut From Underâ€ exhibition years from now. Today efforts are being made to include people with disabilities in the classroom, in the workplace, in the community. So, why in hell is the worldâ€™s largest sporting event still segregated into the Olympics and the Paralympics? Are sports stuck in ancient Greek times? If the Olympics were divided along any other lines â€“ gender, race, religion, economic â€“ there would be an outcry worldwide! Yet, segregation based on ability or disability is acceptable? Not only are the Games segregated, but the Paralympic Games and athletes do not receive anywhere near the attention as the Olympic Games do. My main mission for last weekâ€™s Pre-Olympic Photo Walk was to capture signs that the Paralympics are also coming to town. I found only two! First, on the opposite side of the Olympic countdown clock, I was pleased (and somewhat relieved) to see an official clock for the Paralympics. Interestingly, watching people taking photos in front of the Olympic clock, they did not then go to the backside for photos of the Paralympic clock. And, those people coming across the plaza didnâ€™t realize that was Paralympic clock and were confused there were 44 days to go. 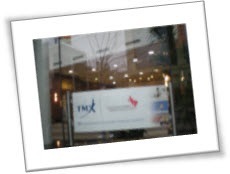 The second sign I found was a banner in an office tower window that read, in part, â€œTMX, proud sponsor of the Canadian Paralympic Foundationâ€. Those were the only two signs I found that elite athletes, albeit with disabilities, are also coming to Vancouver. How welcomed will they feel? Watch the Games official sponsorsâ€™ TV ads. How many include Paralympians? 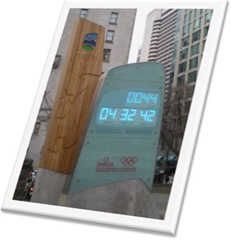 The current ad by Bell, Premier National Partner and Exclusive Telecommunications Partner for the Vancouver 2010 Olympic and Paralympic Winter Games, does not show any Paralympic events or athletes. Furthermore, the ad says the Games are 17 days. Do the math: February 12th-28th + March 12th-21st is not 17 days! The Olympics will be broadcasted ad nauseam; the Paralympics? You will likely have to wait until the Late Night News for a 30-second clip of the dayâ€™s highlights. Even Februaryâ€™s issue O magazine has two articles related to the Olympics. What are the chances the Paralympics will receive the same space in Marchâ€™s issue? Why have segregated Games? Iâ€™m not saying have combined events with both able-bodied and disabled athletes. Although, watching Roberto Luongo and his professional athlete buddies play against the Paralympian sledge hockey team would make for a far more interesting game rather than another NHL-style gold medal game! But, combine the Games, like the how the 2002 Commonwealth Games in Manchester, United Kingdom, included a handful of Para-Sports. Granted, there were only ten events in which elite athletes with disabilities could compete, but a step in the right direction was taken. The Parade of Athletes, athlete village and such were inclusive. Brian McKeever, a member of Canadaâ€™s cross-country ski team who also happens to be legally blind, will be the first-ever athlete to compete in both the Olympic and Paralympic Games. In an interview, Brian said, in part, â€œâ€¦shows what Paralympians are capable of doing, that theyâ€™re training at the same level as able-bodied athletesâ€¦â€ How will his two experiences compare? Will he receive similar sponsorship, media attention and public attention at both Games? What do we tell our youth with disabilities? Work hard and try your best, and one day you could go to the Paralympics too! You may not receive the same sponsorships, the TV cameras may not be there, and the spectators may be fewer, but all of that doesnâ€™t really matter. Just do your best, kid, and youâ€™ll go far. For the first time in history, we were empowered to name the labels that define us. Although the discussion continues, sometimes at ad nauseam, the current acceptable terminology is people-first language, which puts the person before the disability. But, even here, there are issues with the word disability. …disability is defined in opposition to performance and to some extent also health. It is classified by different degrees of ‘problems’ and to define explicitly that ‘trouble’ capabilities must be compared with what is normal for one. What can I say … To me this is a reason for not using the word disability. With the term "disability", there needs to be an ability, a norm, in order for there to be a disability; disability is measured against an ability and is a measure of inferiority, of being less than. Rather, Mama Terapeuta favours "functional diversity" – a phrase now commonly used in the Hispanic community. If I understand her correctly, functional diversity acknowledges the differences in abilities, the diverse ways of doing or functioning, while not implying inferiority or less than. In my mind, â€œfunctional diversityâ€ definitely has merit over â€œdisabilityâ€. However, I wonder if using the term in the English-speaking community would lead to confusion rather than enlightenment, at least until the term catches on. Iâ€™m also left wondering if other cultures have equally thought-provoking terms. What are your thoughts on this evolution of language?